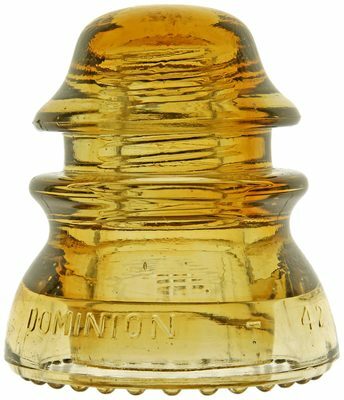 Lot 129: CD 154 DOMINION Color: Golden Amber/Light Amber Two Tone Description: Excellent condition. The color is strong, and one can see some of the two tone swirls in the skirt area, as well as a pronounced left to right color variation in the wire ridge and groove areas. The Dominions come in almost a continuous range of colors from clear to Dark Red Amber, and the medium amber shades are considered to be the most desirable. The two tone coloration is even better in person!